St Aidan's is something of a kestrel's paradise. They are safe from shooting, poisoning and persecution, and the park provides plenty of voles to keep them well fed. You are almost guaranteed to see one, either hunting over the Hillside or Ridge & Furrow, or watching the world go by from the Dragline or the top of a tree. Their graceful, watchful hover is unmistakable in the skies above the reserve. Another day at Fairburn and the passage of a week makes all the difference to the hawthorn bushes on the way – they’re suddenly green! The blackthorn is at my favourite stage – full of round white buds just ready to burst out, and every year I think the bare black twigs look like they’re decorated with tiny pearls. Storm Gareth ruffled a few feathers in the Aire Valley this week, and blew my cobwebs away when I visited St Aidan's on Wednesday. I didn't venture any further than a walk round Bowers – it was difficult staying upright in the wind – where just a few birds braved the choppy waters. A single sand martin was seen over main bay on 2nd March surprising a couple of birders, plus ringed plovers and dunlin moving through signifying the early onset of spring migration and hopefully more species moving through the reserve. Please remember to put sightings in the book at the visitors centre, or if you use twitter post sightings with #fairburnbirds in the text. Skylarks are taking to the air in song already and can be heard throughout the reserve; it seems that spring is already upon us during this freakish spell of unseasonably warm weather. Reports of early arrivals of swallows and sand martins have been made in some parts of the country so keep an eye out and please report any early sightings to the visitor centre. The skylarks are singing at St Aidan's. Go and have a listen. Birds are warming up their voices ready for spring. It's time to start claiming territories and get ready to attract a mate. The recent cold snap saw most of the reserve iced up displacing a lot of the wildfowl; as a result sightings over the past fortnight have been limited although some good numbers occurred of some species on odd days. One of the highlights being 55 goldeneye turning up to roost on the coal tips along with the goosanders, a whole lot of displaying going on which was quite a sight. As we enter the quiet winter spell it’s an ideal time to develop your identification skills if you are new to birdwatching, or just enjoy a walk taking in the surroundings. The discovery trail is an excellent place to spot our smaller birds, plus redwings and fieldfares. Just when you expect reserve to be quieter three more local rarities turn up, albeit briefly and only seen by a handful of observes who happened to be in the right place at the right time. First up on Monday 5th November was a brief sighting of a great grey shrike in the Hicksons Flash area, these birds are scarce autumn migrants and winter visitors with between 150-300 individuals expected throughout the UK. 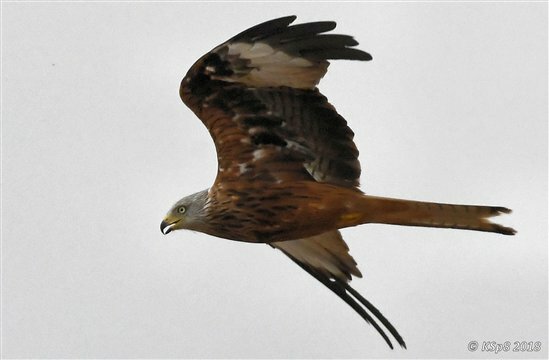 Insouciance personified; red kite at the top of the hill opposite the main lake. Autumn bird migration has rolled around again and our summer visitors are starting to depart as those who pause or winter here are arriving. Without today’s facilities or technologies, migration was a mystery to be explained and by, did some imaginations run riot. Catching insects yellow wagtail style on the eastern reedbed. St Aidan’s continues to delight as summer rolls towards autumn and migration time. Across the site, the hirondines are feeding up and getting ready to head south. Swallows and swifts, house martins and sand martins are still to be seen on the wing plucking insects out of the air. Within the next few weeks they will be off to feeding grounds thousands of miles away.